This private oceanview studio is a great alternative to a hotel room at the Pebble Beach Lodge (where rates start at $800 per night). Located on a gated estate on the Pebble Beach "Riviera," it's a two minute drive to the golf course, the Lodge, spa, shops, restaurants and an upscale market. You'll fall asleep in a brand new Queen bed, there's a kitchenette (with a bar fridge and a microwave to prepare light meals), a dining table for two, a bath with a shower, and a walk-in closet. Outdoors, the spacious terrace is wonderful for enjoying the sunshine, the sunsets, and the forever views across the Pacific. 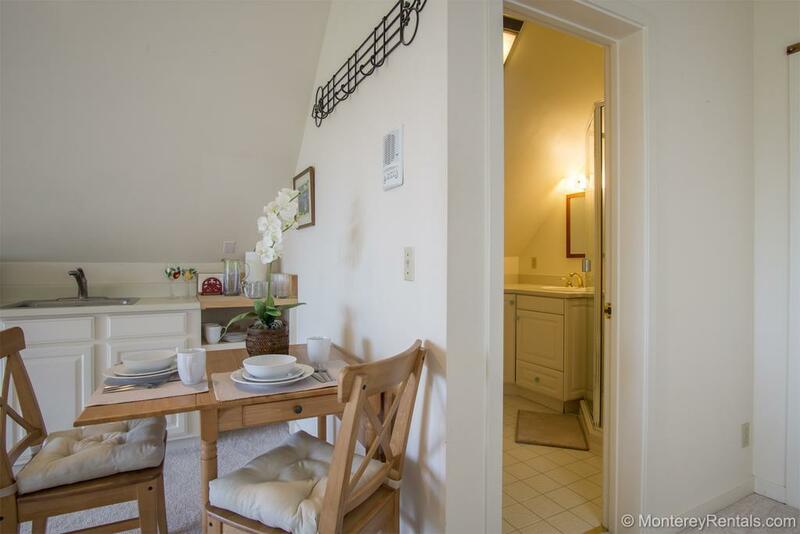 Queen bed, dining area, kitchenette, bath with a shower, and a huge closet.